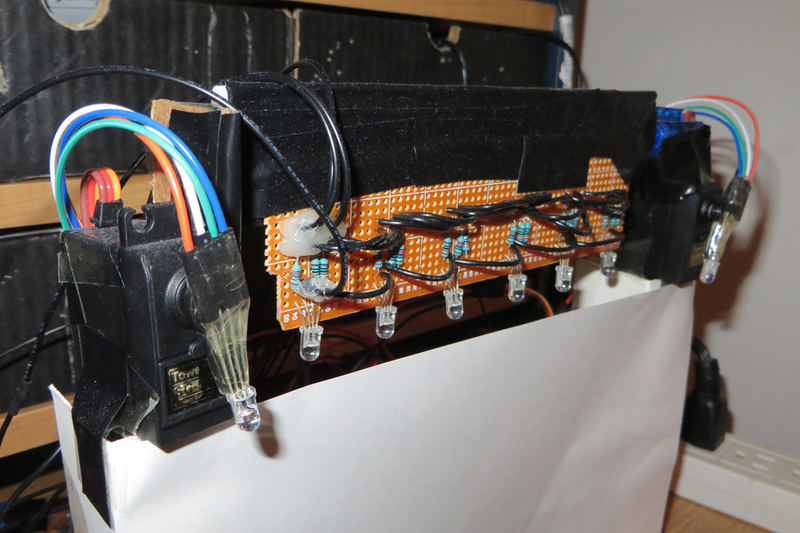 I’m not quite ready to take down the latest Arduino Light Show stage but it’s been sitting around collecting dust, literally which you will see in the photos below. I want to take you through a photo tour and provide some notes on the build. One of the things I first noticed about the horizontal light bar is that, at a certain angle, it makes a neat effect where you see the light of each LED on the bar. Once the light bar is moved away from that angle, the effect is gone. At another specific angle, the light from the bar colors the area below where the floor LEDs are. The red had the most dramatic effect. 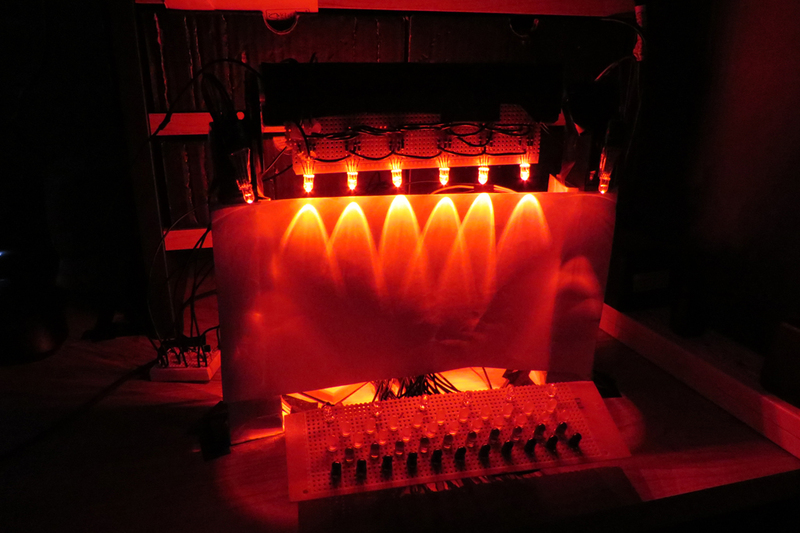 Some day I’d like to figure out a way of being able to see a beam of light from the LEDs so that having them positioned like in the photo above would be more dramatic, especially on camera. I’m fairly certain the LEDs would have to be more high powered and somehow focused so they can be more of a spotlight. My other idea is using fog. These are just ideas, ideas that I doubt I would ever go through with. Let’s take a closer look at the build with the room lights on. These are the transistors I used for the light bar. 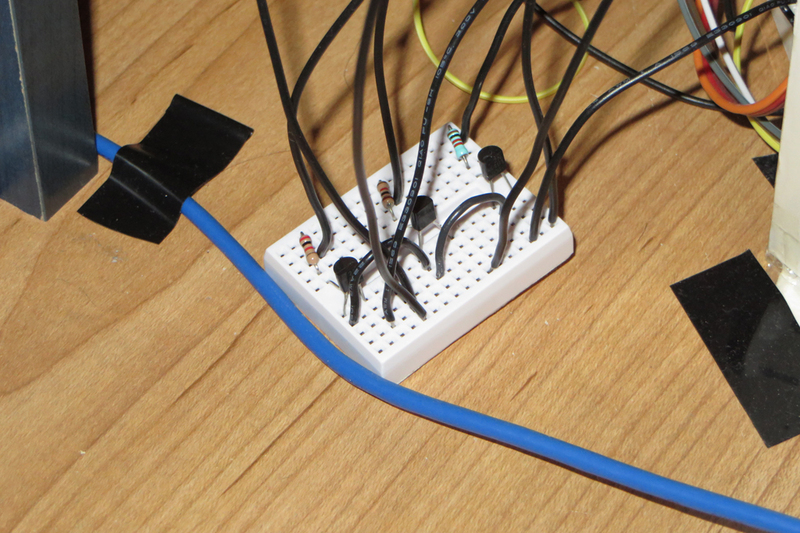 Since one Arduino pin would be controlling six LEDs, it needed transistors to supply more current than the maximum 40mA the Arduino pin can source. I’ve always had a fear of transistors, mostly because I’d get lost trying to do calculations. I’m going to keep working on it… Here’s what the stage looks like. The darkness and colored lights tend to hide its imperfections. I always love taking a top view to show off the mess of wires. Here’s a close up of the light bar. 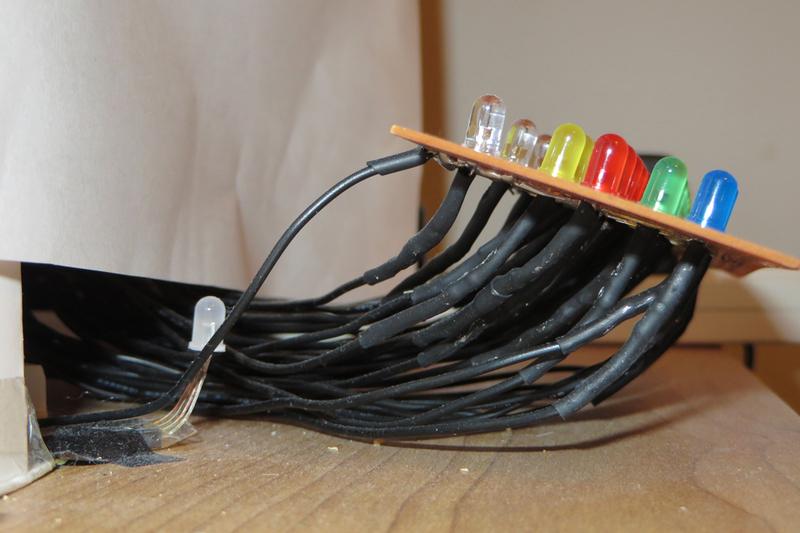 The four wires coming off of the board are stranded wire where the connection to the perfboard is reinforced with some hot glue. I always do that when I’m dealing with stranded wire which, thankfully, isn’t very often. 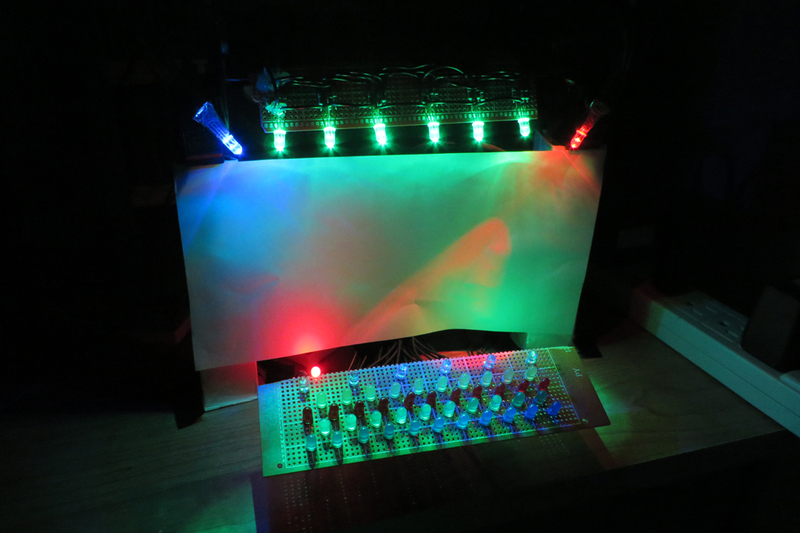 The final picture is a side view of the floor LEDs. 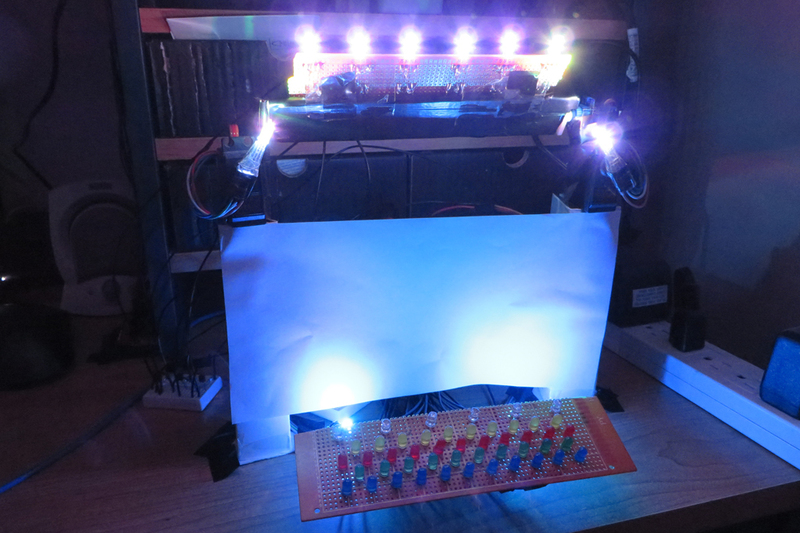 I covered some of the construction of this board of LEDs. It was a lot of soldering and my first time using heat shrink. The diffused LED that’s taped to the table is one of the two floodlight LEDs. 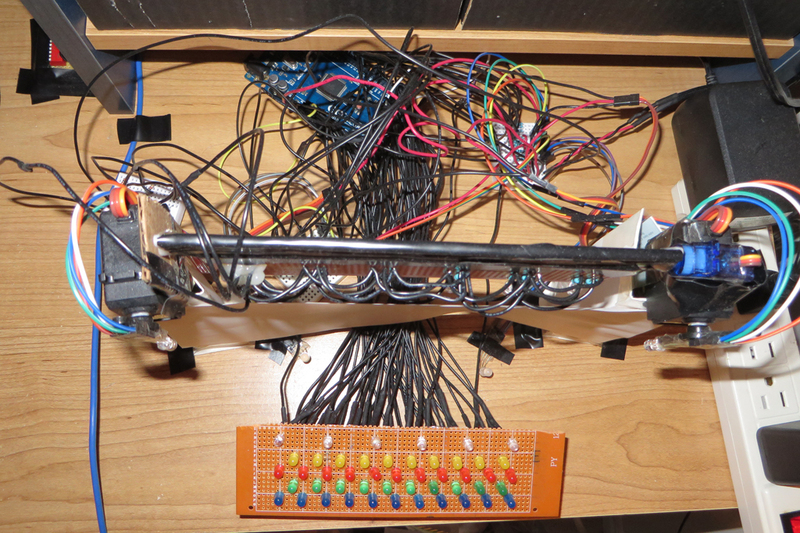 So that’s my tour of the Arduino Light Show 5.2. I’m not really sure what’s next. I feel like I could move on now. We’ll see. Thanks for reading! 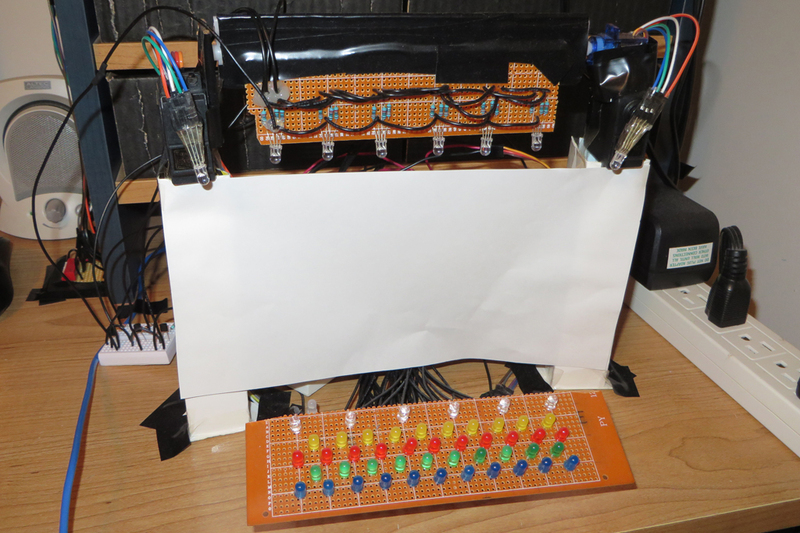 Stay tuned for the next blog post which will cover some of the techniques I use to program the light shows.